In 2013 we had our first guest from Italy travel to Bolender Horse Park to evaluate and see firsthand what mountain trail was all about. They spent their time immersed in the sport, attending a riding and a judging clinic and also taking many riding lessons. While this discipline was designed for the recreational rider, it also challenges the most experienced rider and they left with a new appreciation of mountain trail. In just three years mountain trail in Italy went from watching YouTube videos of Bolender Horse Park, to a beautiful indoor course in that country and brilliant professional rides that were a joy to judge when I visited this November. Here is how Italy was able to jump in and master this sport in such short amount of time. After the first Italian visitors returned from their trip to the US, their enthusiasm spread throughout Italy. Courses were built and with the help of the internet, mountain trail was started as a competitive sport. We were invited by Renzo Canciani of Gottolengo (near Milan) to hold several clinics at his facility which includes a mountain trail course. We held riding clinics, plus a judging clinic with 31 people in it. Many facilities rushed to add obstacles to train on and trainers were working hard to learn so they could teach their students and build a fun, new discipline. We left Italy in 2014 with excitement and the knowledge mountain trail had gotten traction in the country. Even officers for International Mountain Trail Challenge Association (IMTCA)—Italy, were in place. In the spring of 2015 we returned to Europe and built a course in Germany where we held riding and judging clinics and judged a show. Then we traveled to Renzo’s place in Italy again to hold riding and judging clinics, plus adding a clinic on how to build a mountain trail course. We now have over 50 certified judges in Italy. The new elected president for IMTCA—Italy is Lino Tosoni. Lino spent part of his summers as a young man riding in Ireland, but only recently got back into horses after spending a number of years attending college in Italy, the USA and Switzerland. He then working for Merrill Lynch for 5 years in New York and London. Upon returning home, he entered the family business and began riding horses again. We met Lino at a mountain trail riding clinic and we could see that he was hooked on the sport. He decided to visit Bolender Horse Park with his wife to get a real feeling for the new discipline. Lino attended clinics at Bolender Horse Park, and then traveled with us to New Mexico and Colorado where he was able to attend another 5 clinics. While on this trip he made a commitment to bring mountain trail to the Verona Horse Expo in November. This was no small undertaking. First, 40 of the top mountain trail riders had to qualify and be selected for the Italian National Mountain Trail Show, only 3 months away. The second step was to make arrangements to secure a large enough arena and 44 box stalls at the expo. All obstacles had to be built and proof of engineering presented to the expo and IMTCA had to obtain insurance and manage the logistics of bringing in all the materials and building the course. Also, sponsors needed to be obtained in order to pay for our travel, awards and prizes and the arena rental fee and box stalls. Our part was to hold three riding clinics and a judging clinic with all the proceeds going to IMTCA-Italy. Lino and the IMTCA board were able to pull everything together and present to Italy their first National Mountain Trail Show in a grand manner. The mountain trail course was set up in a large arena. A hill was made, truckloads of shrubs and flowers were brought in, large and small banners for backdrops and banners with all the sponsors’ names. Obstacles included logs, rocks, arch bridge, suspension bridge, rolling bridge, raised balance beam, turn-around boxes, gate, cowboy curtain, hillside fan, squirting water box, teeter totter, cross buck and a large water pond with a large dismount concrete block in the middle of it. With many loads of sand the arena remained pristine without any sign of mud and all the flowers and shrubs and obstacles made of stainless steel and stained wood made the course very pleasing to the eye. It was the talk of the expo. We arrived a week before the expo started for we had a number of trail courses to access and we wanted to work a few horses on them. Everywhere we went we could feel the excitement of this new discipline and witnessed how hard the trainers and their students were working to perfect their abilities. 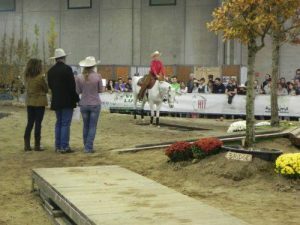 At the championships, the pattern for the open riders started by opening a gate, turning right and then stepping into a lope/canter around the course and to the top of the hill where the horse and rider had a transition to a series of large step downs. Overall the pattern required many difficult maneuvers and thousands of spectators cheered and enjoyed the event. As I judged this class I realized how far the sport had come in Italy in just three years. It moved from a novelty interest in Italy to a new discipline, catching the attention of the Verona Horse Expo. Around 170,000 attended the event, and tens of thousands came to watch the mountain trail challenge which included some of the best riders in Italy. Now back to the riders and the quality of their rides. Both English and western type horses and riders were represented along with several great mules. These were riders that could transition up and down into and out of obstacles. They were able to do 360 turns on the rolling, suspension bridge and teeter totters but what really caught my eye was at the end of the open pattern the horse and rider stepped upon the raised balance beam, walked to the end where they had to take a 90 degree right turn onto a 42 inch box and step off. 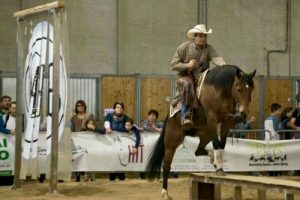 It was a very difficult maneuver for any horse, yet over half of the riders were able to complete it in a manner that brought cheers from the crowd. Speaking of crowds, the large crowds caused so much congestion at this event that next year the expo is moving IMTCA to a large arena, plus will give the top 10 Italian riders free box stalls. Was this event a success? Most definitely. In Italy, the future of IMTCA and mountain trail is bright indeed.